The idea is not innovative, but its application, however, opens up the prospect of quite substantial savings. Measurement equipments now facilitate the task and provide an instructive inventory of energy consumption. Measurement is the foundation stone of energy performance, before considering heavier investments. Is it exaggerated to say that building operators must learn to count? Maybe not, because in many cases, knowledge of energy consumption is limited to the index mentioned on the invoices. However, the precise knowledge of the cosumption of each major item, which can be qualified as analytical, can surprise and bring down many received ideas. This is applicable to all fluids and energy vectors, but probably electricity, water or compressed air have the most to gain, due to the strong capillarity of their uses, unlike oil or gas. Measuring the electricity consumption by major types of uses (heating, lighting, elevators, hot water,…) enables to understand what are the priority energy savings points to deal with. But to start analysing the consumptions by types of services brings a very different vision ! For example, in a hotel, measuring energy costs separately for the rooms, laundry, restaurant,… enables to select more relevant energy savings actions. But this second analysis is however much less common than the first. The sub-metering and measurement of electric power today have interest in the context of relevant and pragmatic analysis. Hence the arrival on the market of software solutions for data analysis, in supplements of dataloggers organized in network. The evolution of national regulations begins to require submetering at the main departure of electrical circuits. Historically implemented in industry, sub-metering solutions currently start to take place in the electrical panels in tertiary buildings and even housing. Now presented as separate modular products to add for the metering of selected low-power circuits, they should eventually be integrated directly into the modular components of the panel for a lower cost. 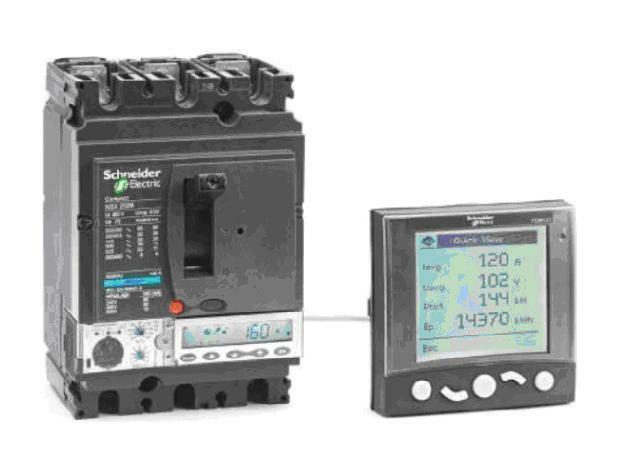 For tertiary panels above 125 A, in general, circuit breakers include a metering function connected to a bus to centralise the data (RS485, Modbus, KNX or Profinet …). For several types of energy meters and power monitors, Legrand option is to assign an IP address to each panel, possibly with the help of a RS485/IP converter, to simplify the communication of consumption indexes to users and managers, directly on PC or smartphone. For commercial and industrial applications, Phoenix Contact provides a structured offer of power monitors Empro adapted to energy management. Phoenix Contact provides other added value for collecting and managing data, with SQL database, SNMP or e-mailing solutions. With the acquisition of start-up Vertelis in 2011, has brought to Socomec the services of a specialist software for energy efficiency. Today, in addition to its meters and power monitors (he manufactures for many of his colleagues, such as Phoenix Contact or Legrand), Socomec provides tools for management, analysis and operation, designed with databases and interfaces close to those of desktop tools. The idea is to push automatically the data and analysis results to the user, so he won’t have to make the effort to go and check regularly these indicators. Important trend: the results of the analysis are then distilled to be automatically routed under different masks to the different “consumers” of this information. This enables both to display some very simple and relevant indicators in the entrance hall of a company and also to inform in detail the technical managers. At the top of the concept, the monitoring software Vertelis Hypervisor synthesizes a multi-fluid approach -fluid reflecting also pressures, temperatures … Socomec is currently expanding its energy monitoring tools to electrical monitoring, providing opportunities to add control functions, such as load shedding or forcing circuits. This is a way to act on the installation based on the collected data. Schneider Electric proposes an offer of power monitors, counters / displays to be connected to the circuit breakers. All these elements are communicating on RS485 bus to allow centralized management via a local hub communicating through Ethernet with the supervision (PowerView software) or remotely via a phone gateway for example. 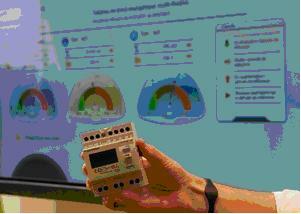 Measuring per circuit and per usage is an important step in the introduction of the smart grid. A targeted action of load shedding, for example, can only take place with a precise knowledge of the corresponding energy potential. or copy this trackback: http://engineering.electrical-equipment.org/energy-efficiency-building/measure-the-consumption-first-step-of-energy-performance.html/trackback from your own site. Please, I want to know if the consumption measurement at first step can be done by a wireless instrument? electrical tracking, offering possibilities to add control features, such as fill losing or pushing tour. This is a way to act on the set up based on the gathered information. Schneider Electric powered suggests an offer of power watches, surfaces / shows to be linked with the routine breakers. really insightful and helpful feature!! Electricity consumption is hard to manage especially when you do not know its measurement. Your blog is very resourceful to all electricity consumption out there. Through measuring the electricity consumption you can limit its usage and when it happen you can save money. In our home when we use appliances we ignore the energy consumption. That is why when the collector asked for payment we are shock because the energy bill is too expensive. We are thinking why it happened because we cannot see the reason why it elevated we call air conditioning repair in Greenville SC to check if there are problems that need solution. Then after checking, the electrician confirmed that there is no problem he said that the energy consumption was high because of excessive usage of appliances that is why the energy bill became high. Is smart grid available in place of keyword because we want to avail to avoid too much use of electricity. We cannot save money at the same time we are contributing damage to the ozone layer. There are many types of devices that are usde to measure the energy conjumption. Saving Energy is the most important task. There may be lack of energy in future.